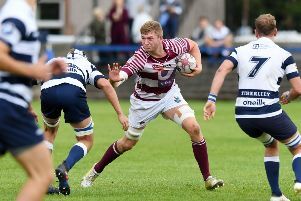 Currie captain Ross Weston praised his side for a professional performance as they progressed to the last eight of the BT Cup on Saturday after a comfortable win over Capital rivals Watsonians. The home side came out on top 31-0 at Malleny Park and await the winners of the postponed Hawick-Melrose tie in the quarter-finals on March 5. Watsonians will now refocus their efforts on gaining promotion from BT National League One. Two early tries from Weston set Currie up for the win. That double saw them 12-0 up at the interval and then Richard Snedden, John Cox and Thomas Gordon crossed in the second 40 minutes. No.8 Weston said: “It was great to get the win as it’s been a difficult second half to the season with weather disrupting games. There was drama right until the last minute at Riverside Park as Jed-Foest came very close to knocking out Heriot’s. Heriot’s were trailing 19-12 in the Borders until a penalty from John Semple and then a try from Max Learmonth put them 20-19 up. In injury-time Gregor Mein had the chance to win it for Jed, but his penalty effort just drifted wide of the post. They do not yet know their last eight opponents with a number of ties still to be played. GHK of BT National League Three caused a shock by defeating top flight Selkirk 21-7 to join Currie and Heriot’s in the quarters. Meanwhile, winger Jordan Edmunds showed why he has been selected in the Scotland Club XV, scoring two tries as Boroughmuir put in a dominant performance to defeat Glasgow Hawks at Meggetland in the BT Premiership. In the process of the 35-14 victory they also distinguished Hawks’ slim top-four hopes. The match got off to a slow start until the home side scored the first points in the 11th minute. They came through a well-worked try finished off by Edmunds. Chris Laidlaw converted. Boroughmuir then added a second try in the 24th minute, Dougie Steele the man to go over this time with Laidlaw adding the extras. Their third try came just before the break, Iain Moody’s great break from the base of the scrum setting up Otulea Katoa for the score which Steele converted. Edmunds added his second in the 53rd minute before Paddy Kelly pulled one back for Hawks. Dale Robertson got ‘Muir’s fifth try before Andy Hill’s late consolation for Hawks. In BT National League One, Stewart’s Melville moved up to sixth place by seeing off Peebles at Inverleith. The home side won 35-6 to leave the Borderers bottom of the table. Musselburgh are in eighth after they were defeated 43-3 at home by a dominant Marr side. The bonus point win on the road puts Marr level with Watsonians at the top. Preston Lodge saw their match at Whitecraigs in BT National League Two postponed while RHC Cougars lost out to West of Scotland in BT National League Three. The Barnton men went down 24-3 at home and they are in seventh place in the table. This coming weekend they face a trip to Cartha Queens Park in the BT Cup third round.